The use of controversy to promote ads is nothing new: from fashion designers using overly-sexualized images of women to sell more underwear to insurance companies using the death of a child to promote life insurance (seriously, it’s messed up), advertisers aren’t afraid to go for the jugular when they want. The question in most people’s minds, however, is should they have gone there? The answer: yes. Advertising is a powerful tool in promoting a message. Every corporation in the world ought to practice some form of social responsibility, or at least promote values that they think are relevant to them and their brand. So the question shouldn’t be should they have gone there, but rather, what could they have done to make it better? That’s the question a lot of companies ask themselves when thinking up new advertising campaigns: how do we talk about a particular issue in a safe way? Or, at the very least, how do we talk about it in such a way that we lose the least number of consumers? Using controversy to push a brand or product is going to get people talking about you, but what they say about you is going to dictate the success of your campaign. In this article, we discuss ads that used controversy to forward a message (and, of course, their brand). We take a closer look at the ads that worked, and we post-mortem the ones that spelled doom for that specific campaign. After consulting with ex-NFL star and former U.S. Marine Nate Boyer, Kaepernick would kneel during the anthem, as he saw this as an attempt to protest the injustices he was against while remaining respectful of the military. This was in reference to the ongoing Black Lives Matter movement happening across the country that saw thousands of black protestors facing police aggression during rallies. This simple act sparked a firestorm in social media, with people being divided between supporting what they saw was a non-violent protest against social injustice and being outraged over what they saw as a disrespectful (some would say treasonous) act towards the flag, the armed forces, apple pie, Eric Clapton, and basically every single thing that is America. 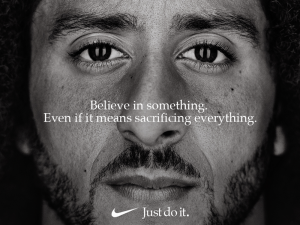 The Campaign: In 2018, Nike chose Colin Kaepernick as one of the faces of their “Believe in Something” series of ads. Immediately after the release of the ad, Nike felt the change: a significant increase of social media followers, an initial dip in stocks followed by an upward surge a few days after, and a whole lot of buzz.While there was a call for a boycott by certain groups of people who disagreed with Nike and Kaepernick’s stance on the issue, it wasn’t enough to make a dent. It’s also worth noting that some boycotters showed their disdain by filming themselves burning their Nike products and uploading it on social media. Although this was effective at showing people the extent of the boycott, it made no difference to Nike’s bottom line: the products they’re burning have already been paid for, so while the symbolic gesture was meant to show disagreement, it was empty and ultimately achieved nothing (other than blowing hot air on social media). Why it Worked: Simply put, Nike knows its target market. Since the beginning, Nike has always sided with the underdog. This created a brand image that showed them as a champion of the down-trodden, and what better issue to highlight this than Black Lives Matter? While this may sound like cold capitalism at work, it worked to everyone’s advantage: the BLM movement was thrust into a more positive light, Nike sales went up, and the embattled NFL star saw a surge in his popularity. A true underdog victory. Background: Oscar Pistorius was a former double-amputee sprint runner from South Africa. He has competed in the Paralympics since 2004, winning a total of 5 gold medals, 1 silver, and 1 bronze. In 2013, he shot and killed his girlfriend at his home in Pretoria, after mistaking her for a possible intruder. Tiger Woods, on the other hand, is a legendary professional golfer and considered to be one of the most successful and popular athletes of the 21st century, with 107 professional wins . But in 2009, he was rocked by allegations of extramarital affairs with more than a dozen women. He took responsibility for his infidelities, and then took an indefinite break from golf. The Campaign: Just days prior to Oscar Pistorius’ arrest, Nike released an ad that featured the double-amputee athlete in a running position with the words “I am the Bullet in the Chamber”, with another ad showing Pistorius running and a voice over describing athletes’ bodies as “weapons”. Why it Didn’t Work: Already you can see the problem with this. Yes, the ad was run prior to the allegations and Nike, in a very good move, immediately pulled all their sponsorships and ads featuring Pistorius. Keeping them in place would not only have been in poor taste, it would also have been bad for sales. Nike’s 2013 ad quoting Tiger Woods also received backlash. 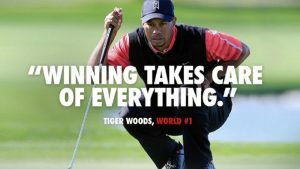 The ad shows Tiger Woods with the quote, “Winning Takes Care of Everything”. Many critics saw this as inappropriate, considering his past marital issues. Although Nike claimed that it was a phrase that highlighted Tiger’s desire to win and, indeed, is a quote that he uses regularly in response to questions about his overall ranking in the PGA. Background: Following a 7-year break from any major global campaign, Coca-Cola releases their “Taste the Feeling” series of ads. These ads features people from around the world, drinking coca-cola and enjoying life in a colorful and diverse world. The Campaign: In a huge shift of strategy, Coca-Cola announced that all their brands will be running the same campaign. The campaign started out with its lead commercial, “Anthem,” which showed a bunch of Coca-Cola-approved moments: friends enjoying some ice-skating, a couple experiencing first love, and a date. Ten TVC’s and 100 static images were also part of the campaign, with each one highlighting the soda brand as a simple, humble pleasure that’s available to all. Why it Worked: Simple, with catchy tunes, colorful images, and a whole lot of dancing. Coca-Cola decided to tackle the issue of diversity in the safest way possible. By relying on non-controversial images to address a controversial issue, and by shifting the focus of their brand towards the consumer (focusing on people enjoying an event with Coca-Cola), the soda giant created a campaign that was able to reach their target market and beyond, revitalizing their sales and boosting their stocks in the long run. Background: In 2013, a series of protests in America by the group Black Lives Matter achieved international attention, with widespread media coverage, a polarized opinion of the whole movement, and various celebrities taking a stance on either side. Personalities from musicians, actors, comedians, and sportsmen (Kaepernick included) weighed in on the issue, providing a powerful voice to what-would-become our country’s biggest social justice movement since the 60’s. The Campaign: The Pepsi Ad took the BLM rallies as inspiration, showing a city attending a peaceful protest, with Kendall Jenner presenting the riot police with a can of Pepsi to show her and the protestors peaceful intentions. Why it Didn’t Work: Where to start? Already you can see how both brands treated their campaigns: one decided to focus on its consumers, and one on itself. One of the key differences between the Coke and Pepsi ads can be seen in their vanity: Coke presented itself as a brand that makes special moments more special. Meanwhile, the Pepsi ad seemingly showed the brand as the solution to world peace and an end to violence in rallies everywhere. On another note, the Pepsi ad suffered from a very severe case of tone-deafness to an issue. While the BLM movement is inspiring, it wasn’t peaceful in some parts: protests in various cities across the country saw violence stemming from both protestors and police, with either side suffering injuries and, unfortunately, casualties. But the Pepsi ad somehow showed a peaceful, even joyful, protest that not only trivialized the movement, it also showed a lack of empathy from the brand. Finally, Kendall Jenner. As mentioned before, various personalities came out either in support or in condemnation of the whole BLM movement. But not Kylie Jenner. While she may have been entitled to her opinion, or lack thereof, using her as the image of peaceful protest not only belittles the sacrifices that people have made, it just reeks of sheer exploitation of her popularity, something that audiences are sensitive to nowadays. Combine all that, and Pepsi received a backlash so severe on social media, it pulled the ad just days after releasing it. Who would have thought millennials had strong opinions? When it comes to controversy, companies should always remember that the spokesperson they’ll be using is intrinsically tied to the controversy that surrounds them. Anything they say can, and most likely will, be used against them in the court of public opinion. Using a controversial event, on the other hand, could work, but nothing short of hyper-awareness and a sensitive touch is required to run it.